A fire pit offers not just opportunities for outdoor cooking but also provides a place to sit and have a fireside chat with friends and family. Fire pits mostly burn wood to produce light and heat. Some fire pits are permanent, some are temporary, and some are portable. Fire pits offer multiple ways of cooking, and can enhance the look of a backyard. 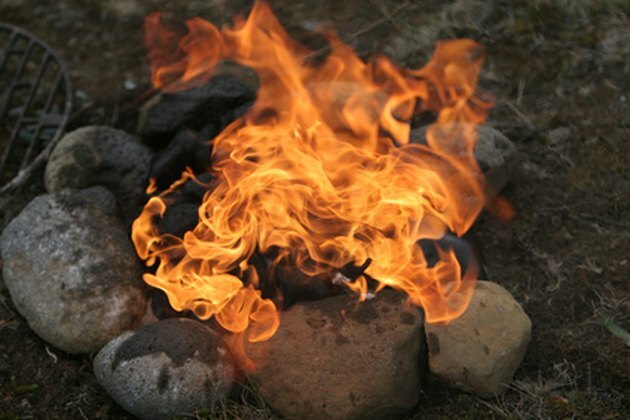 Food can be cooked in fire pits on spits or by putting a grill over the logs. Fire pits are the simplest form of cooking device. Stone and brick fire pits are made by digging a hole in dirt, soil, or gravel. A ring of stones, bricks, or concrete blocks is then stacked around the rim of the pit. This low wall prevents logs from rolling out of the pit as the fire burns. This design can be temporary, with the stones or bricks set in place without mortar, or permanent stone or brick fire pits can be made by mortaring the stones or bricks into place. A permanent grill can be installed onto one of these fire pits by mortaring it. Portable fire pits are large bowls made out of metal or ceramic on short legs. Most of them have a wire mesh cover to prevent embers and logs from spilling out. Some of them have wheels to make them easy to transport. Some also come with a grate placed on the rim of the bowl for grilling. Some portable pits have wide rims so that they can also serve as tables for holding tongs, plates and other items needed for grilling. Not every location is near a good supply of wood for burning in a fire pit. Gas fire pits are most appropriate for these places. They are made of metal and fueled either by propane tanks or by a natural gas line hookup. Unlike wood-fueled fire pits, no cleanup is required after cooking with gas. A chiminea style fire pit is an enclosed outdoor fire pit made of metal, ceramic or terra cotta. It has a rounded body and a tall chimney. Because they are more enclosed than other designs, they trap the heat they generate within their bodies and become hotter faster. An outdoor fireplace is a fire pit designed to look like an inside fireplace. It is an upright structure with a chimney, and is usually built out of stones, bricks or concrete blocks. Some are permanent structures while others are temporary. Most outdoor fireplaces burn wood but some are designed to burn gas.